I made sound board patch cables years ago and have been using them all these years. I thought it might be a good thing to share for those that don't have something like this in their gear bag already. These are the sound board patch cables I made many years ago. They accommodate all the various sound board outputs I have encountered in venues over the years. I used connectors, wire and adaptors I already had to construct these cables. You could use any similar parts you may have to do the same thing. I tied pins 1 & 3 together on the XLR connector side and wired them to ground on the RCA and 1/4" connectors. Then I wired pin 2 on the XLR connectors to the tips of the RCA connectors. These work very well for me, because my pre-amps and main recorder have XLR inputs. So, I can use XLR microphone cables with these to interface with any sound board outputs I encounter in the field. For a sound board that has balanced XLR outputs I don't need the adaptor. The Switchcraft 350X RCA female outputs are used when someone wants to tap off the soundboard feed when I'm already plugged into it. One thing to note is these adaptor cables do not have a balanced output, so it's best to be close to the sound board when using them to avoid any added noise or interference entering the cable and recorder. Other adaptors I always carry include a standard 1/8" stereo to L & R RCA output cable and a couple of 1/4" female to RCA male adaptors. I haven't encountered a sound board in the US that I can't patch out from when I have these items in my gear bag. 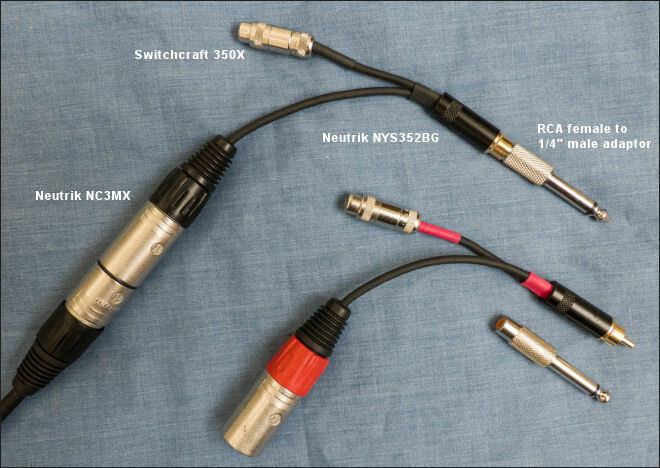 Read this very thorough discussion of sound board patch cables at taperssection.com for more information.